Got a little rust on that old PC keyboard? Has Vista kept you from getting the mileage you expect out of your computer? Are boot times and virus scan leaving you wishing you had an alternative? 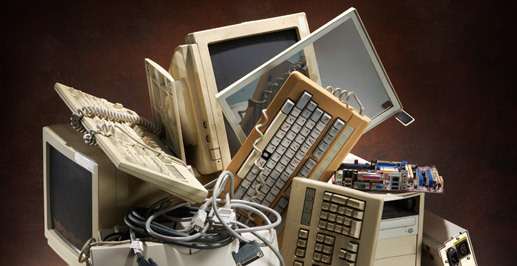 Well, the United States government's new Cash for Clunker PCs program will give you the "green" computing experience you've been seeking without wiping out your savings. "Wow. I thought I'd be stuck with this PC for years. Thank you, President Obama, for this new stimulus program." This new program gives PC users who are stuck with Windows (or even DOS!) the opportunity to cash in that old memory hog for a "real" computer. That's right, for a limited time, we're accepting your tired old PCs in exchange for the state-of-the-art Apple of your dreams. For once you'll be able to take your computer out without being embarrassed about what your friends might think. You can flip open that case and flash that Apple logo with pride and confidence that let's everyone know you're serious about technology. And that you--yes, you--are cool enough to own a Mac. Neither this Site and nor its owner are affiliated or associated with, nor claim any affiliation or association with Apple, Inc., Microsoft Corporation, the United States government, or any owner or licensee of any trademark, trade name, services mark, or other indicia or copyright using the terms 'CASH FOR CLUNKERS' or any variations thereof, and nothing contained Site is intended to imply an affiliation with any such person or entity.